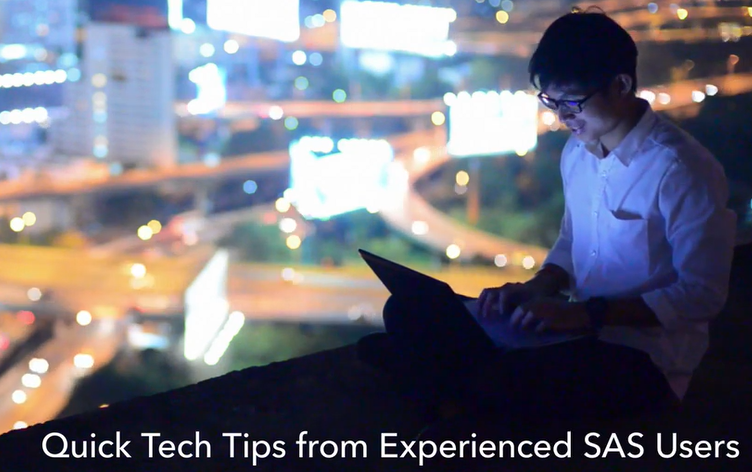 There is certainly no shortage of terrific tips and tricks in various SAS blogs from some of our most distinguished SAS in-house experts. But, there's another group of equally qualified experts who don't often get to share their expertise on this channel: our customers. So, I went on a quest to get the inside scoop from various SAS users, polling Friends of SAS members to get their feedback on their favorite SAS tips. Were any of these tips and tricks useful? Do you use them already? What are some of your top SAS tips and tricks? Please be sure to share in the comments below! Looking for more tips and tricks? Check out this video featuring six Canadian SAS programmers, including a few Friends of SAS members, who share some of their favourite SAS programming tips. If you’re not familiar with Friends of SAS, it is an exclusive online community available only to our Canadian SAS customers and partners to recognize and show our appreciation for their affinity to SAS. Members complete activities called 'challenges' and earn points that can be redeemed for rewards. There are opportunities to build powerful connections, gain privileged access to SAS resources and events, and boost your learning and development of SAS all in a fun environment. Interested in learning more about Friends of SAS? Feel free to email myself at Natasha.Ulanowski@sas.com or Martha.Casanova@sas.com with any questions or more details. SAS tips and tricks: Users-tell-all edition was published on SAS Users.